Kids love to play with cardboard boxes. And pans, colanders, and laundry baskets. It's the everyday items that help a household to run that are seen by children and experimented with in playful ways. "How fast can I push this basket across the carpet?" "Can I stab this spoon into the dirt of that potted plant?" Kids experiment through play and while they are antagonizing the Spider Plant in the corner, they are learning so much. They are building and developing skills that they need for handwriting, buttoning, and cutting with scissors. Sometimes it's the everyday household objects that are so much more fun than toys! 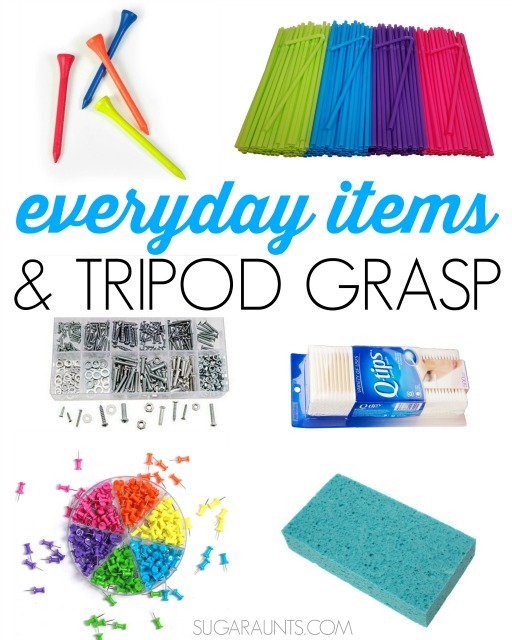 Today's tips use everyday items to work on a fine motor skill that kids need for handwriting: tripod grasp! Recently, I shared with you a series of 31 Days of Occupational Therapy. It was a fun series, and I loved sharing tips using free or mostly free items. Today, I've got an activity that almost made the series, but I just ran out of days. I hope you enjoyed all of the fun ways to work on fine motor and sensory needs, because I could ramble for 365 days on creative ways to work on these areas. This tripod grasp activity is a fun one in our house . 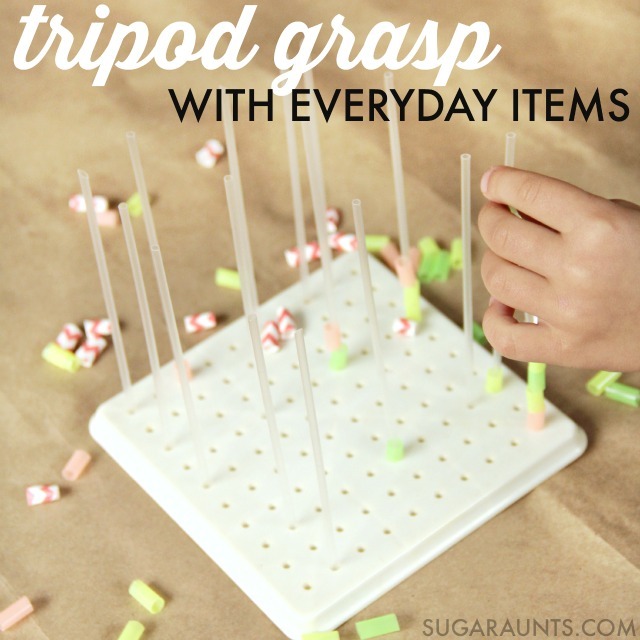 This tripod grasp activity was one that we put together one day while cleaning out a cupboard. I shared it over on Instagram recently. This Peg Board with 1000 Pegs is one that I've had in my OT treatment bag for 15+ years. It's one of my favorite treatment tools for working on so many areas. Push small pegs into the holes to work on in-hand manipulation, tripod grasp, and pincer grip. Copy designs with pegs and work on hand-eye coordination, visual scanning, visual perceptual skills, form constancy, and more. Turn it over and use the back as a mini geoboard with string small loops. Tilt it on a slant and work on an extended surface. This little pegboard has been used by tons of kids working on so many skills. It really is one of my all-time favorite OT activities. I love that I now get to share this pegboard with my own kids. We pulled out a handful of straws from a box of juice drinks. These straws were left over from a party where we didn't use the straws. You could save small straws like this from juice drinks and wash them out. I showed my daughter how to push the straws into the peg holes and she took over, arranging the straws over and over again. We then used cut up pieces of straws and threaded them onto the straw pegs. Cut a straw into small pieces and thread them onto the juice straws. Picking up the small straw "beads" and threading them onto the juice straws is a great way to work on tripod grasp. Using the thumb, index finger, and middle finger to pick up small items uses a tripod grasp. This efficient grasp is needed to hold a pencil effectively while handwriting. The small straw pieces require an open thumb web space and defined arches of the hands. What a fine motor workout this is! 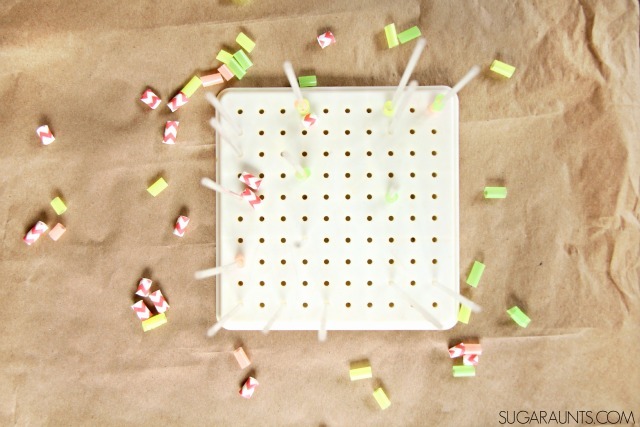 Ok, so say you don't have juice box straws to use in a pegboard. You can use a variety of other household items in a similar way to work on a tripod grasp. Push toothpicks into a spice container. Push acorns into play dough. Drop dry beans into small containers. Press sticks into play dough. Paint with small squares of cut up kitchen sponges. 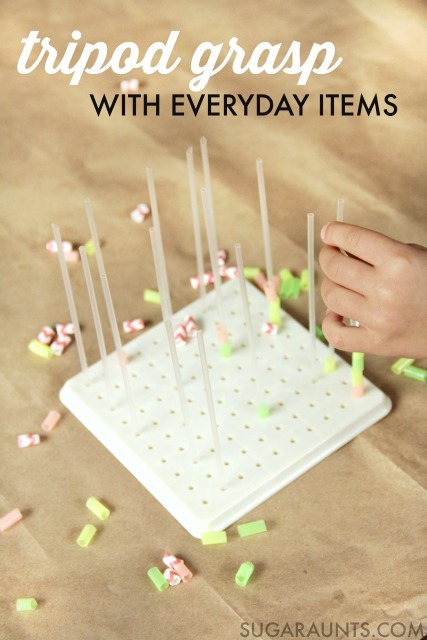 Press push pins into a bulletin board or recycled containers. Push golf tees into a shoe box. Press game pieces into play dough. Use tweezers to place small balls of tissue paper into a container. Push small pieces of pipe cleaners into a cardboard box. Can you think of household items that can be used to work on tripod grasp? Let me know on my Facebook page! These Colorful golf tees are bright and colorful, and perfect for pressing into stryofoam or thing cardboard. Straws can be cut into small pieces and used as beads. Thread them onto pipe cleaners, string, or other straws. Screws, nuts, and bolts are a great way to work on tripod grasp and other fine motor skills like in-hand manipulation and rotation. Q-tips make a great writing utensil. Work on tripod grasp while painting with them. Use Push Pins to work on tripod grasp like we did here. Watch the pointy end with younger kids! Use a Kitchen sponge to work on a tripod grasp by cutting the sponge into small squares. Squeeze water to fill a container, or use them to paint.